Sara Melnicoff discovered the joys of taking care of the land in 1994 when her life partner David Morgan took her on her first cleanup along the Animas River in Durango, Colorado. Since then, hundreds of thousands of pounds of trash and recycling have passed through her hands on the way to better places. Addicted to the "great feeling you get when you look back at an area you just cleaned," the cleanups increased in frequency over the years until they became a daily activity, and Moab Solutions was born. While conducting cleanups around Moab, Sara found homeless people living in camps along Mill Creek, and started working with them. With assistance from Moab Solutions, they are learning how to help themselves and are engaged in cleanup, restoration, and recycling activities throughout the community. One of Sara's favorite activities is working with the Mill Creek Partnership to improve the health of Mill Creek Canyon. Prior to founding Moab Solutions, Sara worked as a legal secretary for a public defenders' office in Maryland, where she saw firsthand the range of challenges that face people who are economically and educationally disadvantaged. This work was one of the inspirations for her interest in helping the homeless, as was her longtime partner David Morgan. O'B. Out doing field work. ​Bob O’Brien taught sociology at California State University at San Bernardino from 1974 to 1981 and at the University of Oregon from 1981 to 2008. He was Department Head for over half of those years of teaching and for three years at the University of Oregon was Associate Dean with oversight for the Social Sciences. 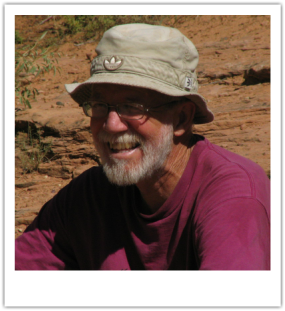 He served as Board Chair of Citizens for Public Accountability for five years (in Eugene Oregon) and as Interim Board Chair of Oregon Toxics Alliance (now Beyond Toxics). As a member of the Willakenzie Planning Team, he helped create a neighborhood plan for the City of Eugene, as well as the "New Community Meeting," which bought together business owners, developers, and citizen activists in Eugene. He recently retired from teaching at the University of Oregon. ​Robin Zank is one of a kind. Her talents run deep and in many directions. She owned and ran a scratch bakery, Knave of Hearts, for decades, first in Vermont, then for a long stint in Point Reyes, CA, and finally in Moab, Utah. The bakery closed in 2008, and is sorely missed by all. Robin also puts her creative talents into sewing, painting, and making gorgeous multi-media pieces of art. Robin now works at the Community Closet, a thrift store in Livingston, Montana. During her tenure, she has more than doubled the store's revenues through her great customer relations and her retail experience. Her devotion to reuse is an embodiment of one of Moab Solutions' core goals. Everybody loves Robin. She has been a steadfast supporter of Moab Solutions since the earliest days when the group was just an idea. She remains a loyal and invaluable supporter. Mary. Outstanding in the field. ​Mary O’Brien (Ph.D., botany) has been working for the Grand Canyon Trust since 2003, and currently serves as Utah Forests Program Director. She works with other conservation organizations to encourage the U.S. Forest Service to conserve wildlife habitat and native ecosystems on southern Utah’s three national forests (Dixie, Fishlake, and Manti-La Sal). She previously served as a staff scientist and organizer for toxics reform and conservation organizations including Northwest Coalition for Alternatives to Pesticides, Environmental Law Alliance Worldwide, Environmental Research Foundation, Science and Environmental Health Network, and Hells Canyon Preservation Council. 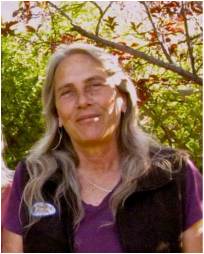 From 1992-1994, she was an Assistant Professor (Public Interest Science and Environmental Advocacy) in the graduate University of Montana Environmental Studies Program. Mary's work has always focused on developing and proposing alternatives to be considered by public agency and public lands decisionmakers. Her book, Making Better Environmental Decisions: An Alternative to Risk Assessment (MIT Press 2000), provides numerous examples of the power of alternative proposals and assessments to leverage positive change. Carol, sorting at the recycle center. ​Carol Hoggard was born and raised in California. 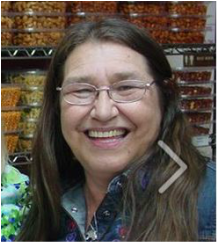 A graduate of Northern Arizona University (NAU) in Flagstaff, Carol taught elementary school for over 20 years. 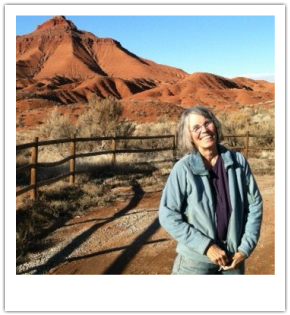 When she retired in 1996, she moved to Moab, and has been involved with a wide variety of volunteer activities since her husband's death in 2002. 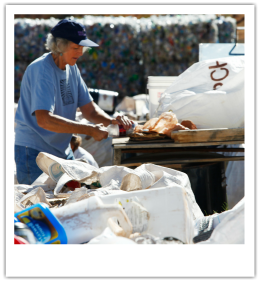 She’s been part of Moab Solutions since their beginning, because she supports their work to promote respect for the earth by not littering, and by reducing, reusing and recycling. Community service awards include: Woman of Achievement (2004), Silver Bowl Award for Grand County (2004), AARP Andrus Award for the state of Utah (2011). Carol's generous reach extends across the community in countless ways and she is a treasured part of Moab Solutions. She teams up with Sara to rescue recycling from the trash.